All I know is Kate Spade is my sisters' favorite bag designer. It's all I hear... Kate this, Spade that. So this one is for them. Through midnight Wednesday Kate Spade New York and eBay have teamed up to discount over 90 items at 50-75% OFF. We got purses, jewelry, clothing, sunglasses, wallets, even iPhone cases marked down. I looked through them and the lowest discount was 50% OFF. 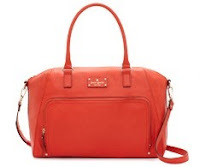 Click here to view the Kate Spade sale at eBay.